I can never really express what Mom has meant to me. Even as a young mother, she somehow knew how to love unconditionally, while providing guidance and consequences – tough love – when we needed it. As Mom turns 90 on May 24th, I want to share the video I made for her 85th with more of you, and highlight just a few of her many talents hidden in the lyrics. Your comments, calls, cards and letters will be a birthday gift to her. Thank you! bit by bit, the quilter makes a comforter Mom knew that a quilt was more than warmth. With its many colors, and love sewn into every piece, it truly was a comforter. piece by piece, the peacefulness is grown It takes a lot of patience to make a quilt, as it does to raise kids. What a blessing it was to be raised in a peaceful house. Were there problems, disagreements? Of course. But fighting was never the answer. so no-one has to sleep alone Sleeping with one of Mom’s quilts is sleeping with love. 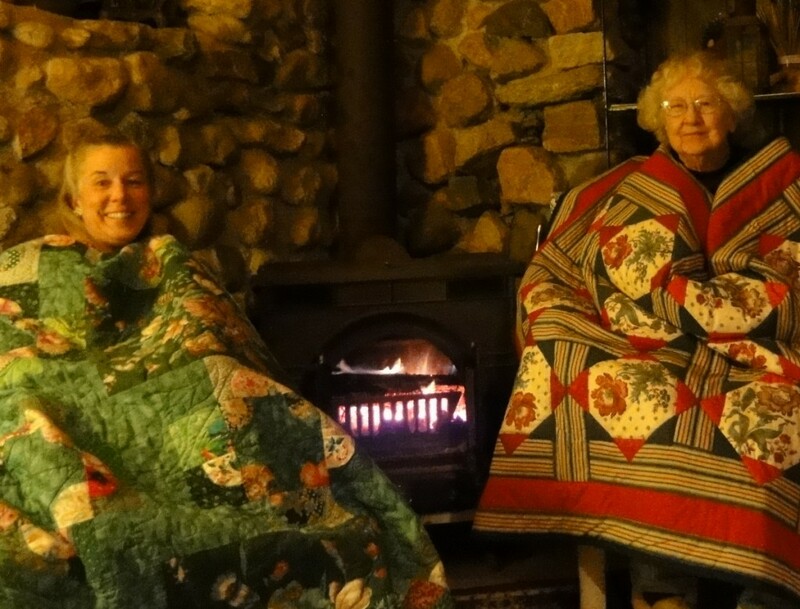 day by day, the quilter is a comforter Mom was and is a comforter. No matter what the problem – a skinned knee or broken heart or failed ambition. Her understanding love always found the right words to comfort me and so many others, and still does. word by word, she listens to your heart Mom might be surprised to hear me say she always found the right words, as she has always said English was her weakness. But listening is the source of words, and she has always had that gift. She knows how to listen without judgment, yet share her opinion and wisdom, both in words and action. year by year, her handiwork may fray and wear The pictures of Marissa, with the shredded blankie “Gramma Audrey” made for her are two of my favorites. Though void of warmth and even color, clearly there was still some love coming through those threads. but good friends never tear apart Mom is grateful for the friendships that have lasted since days of youth. They are a testament to her and those friends. But it also speaks volumes that young people who rented from her and Dad or were taught quilting or mentored in other ways have grown into adults maintaining and treasuring their relationships with Audrey. It wasn’t unusual for my friends to say they envied me for my mom and our relationship, and I was happy to share her with them. never wasting, always tasting new creations from the old Truly, my lifestyle of frugality and creative up-cycling was inspired by my parents’ thriftiness and ingenuity. We didn’t have a lot, but never wanted for anything. cutting, sewing, laughing, knowing quilting stories often told Mom sewed and quilted at home (I often fell asleep to the sound of her sewing machine and sometimes still hear it in my dreams!) but also loved being in quilting groups. What could be better than sharing scraps of cloth, ideas, and stories? love her blankies, used as hankies, and as diapers, truth be told Okay, so I doubt any of her baby quilts were really used as diapers (creative license, you know) but they went to so many little nippers that I’m sure a few were peed-upon. She wouldn’t mind. They were to be used, not just for show. It wasn’t unusual for Mom to see a mother and baby on the street and ask “Does he have a quilt?” If the answer was no (or even yes) she would often go home and return with one. It would be hard to say who got the most pleasure from these surprise gifts! face by face, she smiles at every shape and hue Mom loved every kind, color, and shape of the pieces she quilted, and could fit them in to one quilt or another, just as she loved every kind, color, and shape of the people she met, and could fit them all into her heart. row by row, connecting as she goes She loved bringing people together, whether to quilt or just visit, and made real, not just superficial, connections. she warms our hearts and hands and toes Yes, it’s true. She met Dad on a sleigh ride and he fell in love with her when she warmed his toes–sticking out of the cast on his broken leg! fingers bending but still lending love to every block and band As in most quilters, arthritis bent her fingers as she aged, but that didn’t stop her. nothing’s perfect, no-one’s finished, ’til returned to dust and sand The graceful acceptance of imperfection, one of life’s most important lessons, was one she taught and also learned as quilting became more difficult. I am so grateful to be one of the many. I love you, Mom, and always will.